Join me this summer in the garden of the Mistral Hotel to create another garden – one for the gods – with ancient Greeks and their inventive design. We use a mottled watercolour wash to depict the garden’s background and sky where we shall place the gods. There is too a Tanagra goddess. She comes from the town of Tanagra in Boeotia and was the naiad nymph of the town’s well. She was the daughter of Asopos, the river god and figurines of her were moulded from the later 4th century BC, mostly in Tanagra. Coated with a liquid white slip, they were then fired and sometimes painted afterwards in naturalistic watercolour tints. We use a variety of pens to enliven the garden’s imagery. Vivacious depictions of life, death and deference to the gods, permeate the pots, plates and borders of ancient Greek craftsmen. With a ready prepared selection of characters and decorative innovations, we recreate, on a modet scale, the mood and motifs of these long lost craftsmen. Circular tiles in the garden are represented by a plate bearing swallows, lotuses and buds, which is a backdrop to an urn of flowers. In the centre we place a woman (or is it a man?) playing the kithara, a seven-stringed instrument which was a professional version of the two-stringed lyre and associated with the god Apollo. In mythology it was invented by Hermes who made it from a tortoise shell. The musician (a kitaristu) needed much skill to play this difficult instrument, usually as a solo accompanied by a song (a kitharodeia). 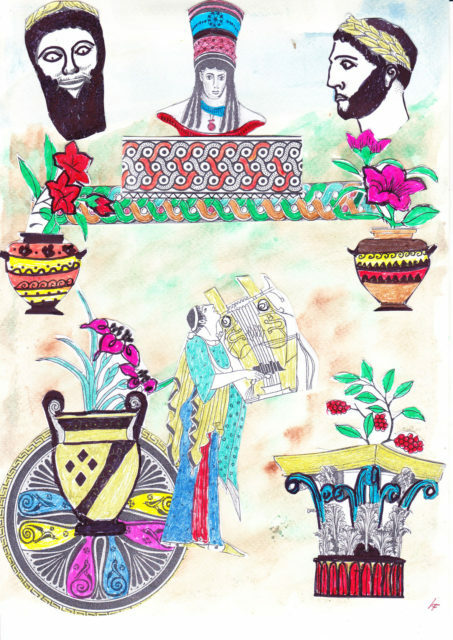 There were performances at festivals and music competitions, such as the Delia, the great Ionian music festival held on Delos from the Archaic period. Playing the kithara was also and important part of a young man’s education. The instrument made a wave-like sound with strong, deep notes and was plucked with a plectrum of wood, ivory or metal and was often depicted on pottery and coins. The kitaristu in our garden is comparatively insignificant, symbolising the fragile mortality of man compared to the gods and, in this case, the burgeoning garden. Among motifs used by craftsmen were hybrid creatures – as decoration or related to mythology, such as the Siren; half bird, half woman, the bull-horned head of a man, representing a river god and the man’s body with a bull’s head which of course depicted the minotaur who roamed the Cretan labyrinth. The Triton was half man, half fish and Griffins were lion-bodied, winged and eagle-headed, while the hippocampus combined horse and sea creature. Floral motifs ranged from lotus, olive and laurel, to ivy and rosettes. The acanthus has a fascinating past. It was said a Corinthian girl died of disease and was buried with her belongings in a basket on her grave covered for protection by a roof tile. The basket was placed on an acanthus root which when pressed down by the weight, sprouted leaves and tendrils. The tendrils grew along the basket’s side and turned outwards and when they met the corners of the tile, began to curl over at the ends and created a coil at the edges. The sculptor Calimachus passed the grave and was so inspired by the plant, began to create shapes which became the elaborate Corinthian columns on monuments. We use the top of a column as a decorative element in the garden. And ancient temples had brightly coloured aspects. They were not just bare marble as we often imagine today. Elsewhere a Gorgon’s glance could turn you to stone. Perseus beheaded the Medusa, the only mortal Gorgon and her head often appeared as a protection against evil on temples and was even thought to protect a drinker if depicted on a cup! Single eyes are still made and worn as protection. 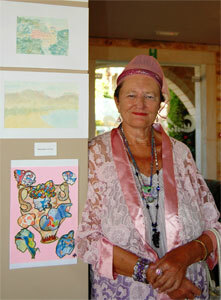 Time Off In Crete With Linda Talbot – Mistral HotelI have always drawn and painted and reviewed art exhibitions for many years on the Hampstead and Highgate Express in London. Each year I have an exhibition in Hania with one or more other artists and I enjoy experimenting, specialising in collage, and often working in series.